Bluestone Developments (NSW) (BDS) today unveils its plans to deliver a brand new development – Rohan’s Run, located in the burgeoning South West Sydney suburb of Austral, one of Western Sydney’s fastest growing areas. Named after Mr John Reoch Rohan and his family who have been owners and residents of the land for 82 years, Rohan’s Run is located just twenty five minutes from both Campbelltown and Liverpool city centres and approximately less than an hours drive (55km) from Sydney CBD, with quick access to the M5, Westlink M7 and Leppington train station. The estimated $27 million development will ultimately comprise of approximately sixty two homes spanning a 2.023 hectare site, with the first stage comprised of twelve lots to be released on February 1 2019. Lots will range in size from 303 square metres to 337 square metres, with a starting price of $349,000. Rohan’s Runs has close proximity to amenities, transport and services, leveraging the significant, government-backed infrastructure planned for the region, makes the development an outstanding opportunity for those looking to secure their position in the market, especially first home buyers who have found it difficult to purchase property due to housing affordability issues in Sydney. Furthermore, Rohan’s Run is just a twelve minute drive to the new Western Sydney Airport, which is expected to begin operations in 2026, generating around 20,000 direct and indirect jobs by approximately 2030. In addition, the development neighbours some of the most highly regarded schools in the area, the beautiful Western Sydney Parklands, recreation areas, cycling and walking tracks and the convenience of the local Austral shopping village, with plans for a future Supa Centre and Town Centre. Richard Whitehead, Founder and Managing Director, Bluestone Developments (NSW) said “When designing this new development, we deliberately intended Rohan’s Run to be a place where families, first home buyers, upgraders and downsizers would be well looked after. Our team have taken into account the vision of the area whilst paying homage to the history of the land and its previous owner”. “We have also benefited from The NSW Government’s initiative to declare growth areas, rezone precincts and heavily invest in infrastructure for urban development in South West Sydney, which has allowed us to plan and invest with the confidence to provide Sydneysiders with affordable new housing. Given Rohan’s Runs’ proximity to Badgerys Creek Airport and the aerotropolis, which will be built around it, residents are likely to see that Austral will become even more of an important strategic centre for the area” Mr Whitehead said. John Castellano, Group General Manager of Sales and Marketing, Bluestone Developments (NSW), furthered this by saying: “In Sydney’s South West, we’re now seeing an infrastructure development program which has been thoughtfully and strategically planned to coincide with the release of new residential land. We are also tackling the housing affordability challenge head-on by focussing on supply and keeping the dream of home ownership alive for home buyers in Sydney, whose confidence in owning their own home may have waned over the past few years. Rohan’s Run is affordable, yet perfectly located in Austral at the heart of this important growth corridor and the early registration enquiries have been very encouraging”. The managing sales agent for Rohan’s Run is White Square Properties. Rohan’s Run is located at Sixteenth Avenue, Austral. Rohan’s Run will be released to the public from Friday, 1 February, 2019. To register your interest go to: https://whitesquareproperties.com.au from 17 January, 2019. Bella Vista real estate agency, White Square Properties has recorded a stellar six months after rebranding from Elderton Realty and refocusing the business to provide sales solutions for small property developers. 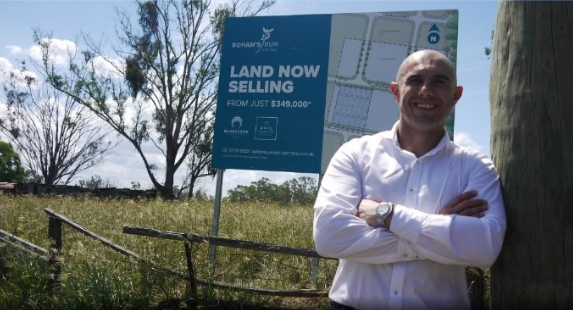 In the past six months (excluding January) the business has sold over $76 million worth of land and house and land packages primarily in Riverstone and Schofields in the North West and Austral in Sydney’s South West. Over 70 house and land packages were sold with an average price of $675,000 and more than 65 land lots with an average price of $400,000. John Castellano, Sales and Marketing Manager for White Square Properties comments, “The new focus has paid significant dividends for the company. Its reputation has spread very quickly amongst smaller property developers. The team possess a broad cross section of knowledge stemming from relationships with key builder partners, with an emphasis on smaller land product. The focus on smaller lots has not only benefited land developers, but assisted budget conscious buyers enter the housing market. First home buyers have secured over 80 per cent of house and land packages in Hillside Estate’s first release along Crown Street in Riverstone. Most of the purchasers were from surrounding suburbs including Quakers Hill, Baulkham Hill and Schofields. Twenty house and land packages have already sold, with a further 10 to be released next weekend. Land starts from $373,000 and house and land packages are priced from $609,000. There is a mix of three and four bed home packages comprising single and double storey with frontages up to 12 metres. A selection of open plan living designs with contemporary facades and inclusions are available. Features include alfresco dining spaces, European appliances, walk in pantry and an ensuite to the main bedroom. The land parcel is two kilometres from three schools – Riverstone Public School, Riverstone High School and Norwest Christian College. Riverstone train station is only three minutes from Hillside Estate. Lot sizes range from 280 sqm to 383 sqm. Home sizes are from 15 to 25 squares. It is also located within a 10 minute commute to Riverstone train station, Rouse Hill Town Centre, Norwest Private Hospital and the future Rouse Hill train station on the North West Rail Line. Sydney’s CBD is an approximate 45 minute drive. Western Sydney Parklands is a short three minute drive from Kingfisher Estate and a number of primary and high schools, including Austral Public School, Thomas Hasall Anglican College and Unity Grammar College are within a seven minute drive. Tertiary institutions including TAFE South Western Sydney Institute, Western Sydney University and the University of Sydney, Cobbitty Campus are within a 25 minute drive.